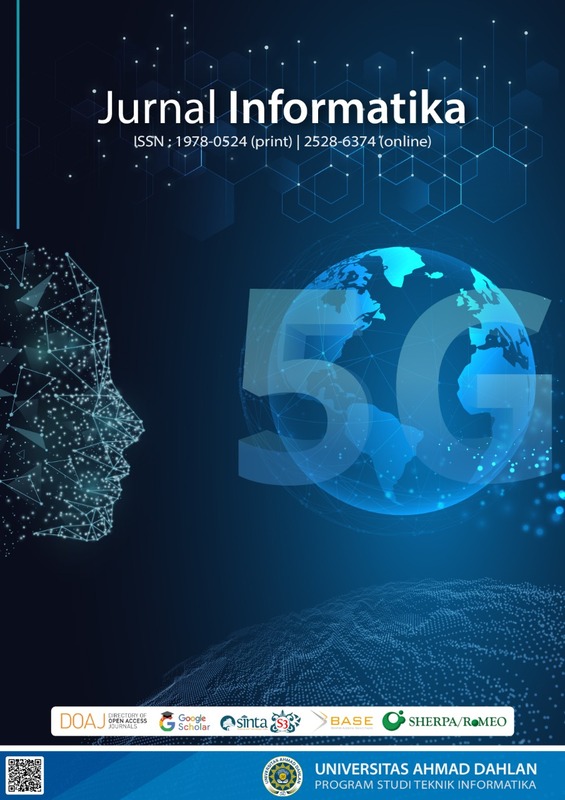 Jurnal Informatika (pISSN: 1978-0524 eISSN: 2528-6374 DOI Prefix: 10.26555) aims to bring together research work in the area of Information science and technology, multimedia system, and computational intelligence. It’s a peer-reviewed journal that written in English which is published three times in a year start from Vol 13 No 1 January 2019 (January, May, and September), and review process using single-blind peer reviews. The Scope topics include, but are not limited to : Agent System and Multi-Agent Systems, Analysis & Design of Information System, Artificial Intelligence, Big Data and Data Mining, Cloud & Grid Computing, Cryptography, Decision Support System, DNA Computing, E-Government, E-Business, E-Learning, Embedded System, Enterprise System, Human Computer Interaction, Image Processing & Computer Vision, Informatics Theory, Information System, IT for Education, IT for Industry, IT for Chemical, Mechatronics, Mobile Computing & Applications, Natural Language Processing, Network & Data Communications, Open Source System, Semantic Web, Social Networking & Application, Soft Computing, Software Engineering, Software Entrepreneurship, Web Engineering, and Wireless Communication.